Posted on Sat, Apr 24, 2010 : 7:30 p.m. Most of the year Bee Balm blends in with the other simple green low growing plants with opposite leaves. I’ve overlooked it countless times, and I’ve mistaken other plants for it as well. But once you smell it, there is no mistaking it for another plant. Simply crush or rub the leaves and a wonderful scent of oregano with hints of mint and thyme is released. I smell the oregano predominantly, but that is a simplification of this rich, enticing, strong and lovely odor. This native plant is found on the edges of woods, in fields, and likes bright sun light. It is in many Ann Arbor parks, in plain sight but can be hard to spot until it flowers. 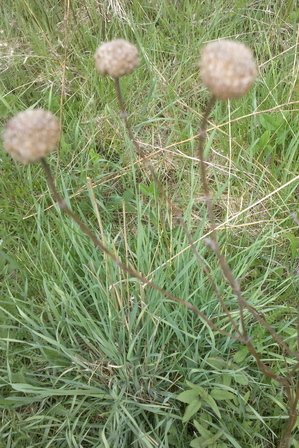 Look for last year's dried flower stalks. Bee Balm is a perennial. In July and August the plant is easy to spot, growing almost to your knee or higher with stringy looking flowers that are red or a light lavender. The flowers also have the wonderful aroma. And indeed the bees are attracted to it. Last summer I was clearly competing with a batch of bumblebees as I collected the wild flowers. We worked it out. 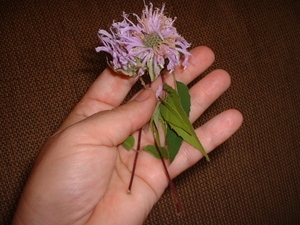 Bee Balm, also known as Bergamot, Latin name Monarda, includes over a dozen varieties. Monarda fistulosa is the wild local variety. I’ve been assured - erroneously it turns out - that this is the plant used in Earl Grey tea that gives it a special flavor. It is not. The Bergamot Oil added to Earl Grey is Citrus bergamia, an entirely different plant. 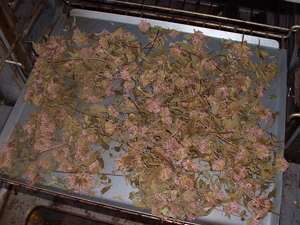 Bee Balm is used as a tea, for both medicinal effects and for a pleasant flavor. The benefits include strong antiseptic value, as a stimulant for colds and sore throats (you can use it as a steam for sore throats as well) and gastric benefits for nausea and gas. It can be used externally for infections and when you have simple irritations of the skin that would be helped by a mild and gentle antiseptic. I especially like to use it by the handful in spaghetti sauces, chili, on pizza and other places where I might otherwise have used basil or oregano. Is it my imagination that my chili is less gas producing when bee balm has been added? It seems to help. 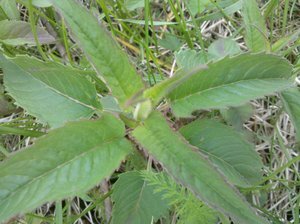 I gather Bee Balm throughout the spring and summer, using the fresh leaves for the first few months. In August I like to gather enough to last the winter, flowers and all. Last year I dried a half gallon, and found that was much more than I needed even though I use a lot each time. Gathered fresh, it will last five to seven days in the refrigerator in a bag. To dry it either leave it out in a cool dry place for a few days until crumbly, or spread it on a cookie sheet in a slow (200 degree) oven. I bake it for two to three hours, and then often turn off the oven and leave it overnight. Store the dried herb in a glass jar with a tight lid in a cool dark place. Expect it to last about a year. This is a fun plant to surprise your friends. I love to pick a few leaves, that have blended into the landscape, crush them and invite my companions to sniff. The smell is not something you would expect from such a simple nondescript plant. Almost everyone reacts with surprise and pleasure. Bee Balm is a nice addition to any walk through a woods or field. Her cookbook Spinach and Beyond: Loving Life and Dark Green Leafy Vegetables is available at Crazy Wisdom Bookstore, and through Amazon.com. Thu, Apr 29, 2010 : 8:12 p.m.
Thu, Apr 29, 2010 : 2:40 p.m.
@spiritgrove There can never be enough reminders of the interrelationship and responsibility associated with wildcrafting. Thank you for that. I'm more in tune with the bees than the hummingbirds, and they need this food as well late in the season. What I've observed around here, is that bee balm is so well established that even picking enough for a full year's use doesn't even begin to touch the abundance of the bee balm. You can hardly tell anyone has been there. I'm full of articles about the plants right now, (so many are up and want attention!) but will write again soon about the ethics of wildcrafting. Thank you for your addiittion on that important topic, as well as more uses. Thu, Apr 29, 2010 : 2:27 p.m.
Thu, Apr 29, 2010 : 2:06 p.m.
Mon, Oct 17, 2011 : 3:11 p.m. I also appreciate the red flowered version of this plant for it's ability to attract hummingbirds. It does spread quickly though and can take over a garden if you don't control it every spring. Mon, Apr 26, 2010 : 8:29 a.m.
A friend just split his Bee Balm patch and gave me some, and I haven't been sure what to do with it, so this is really timely and helpful!